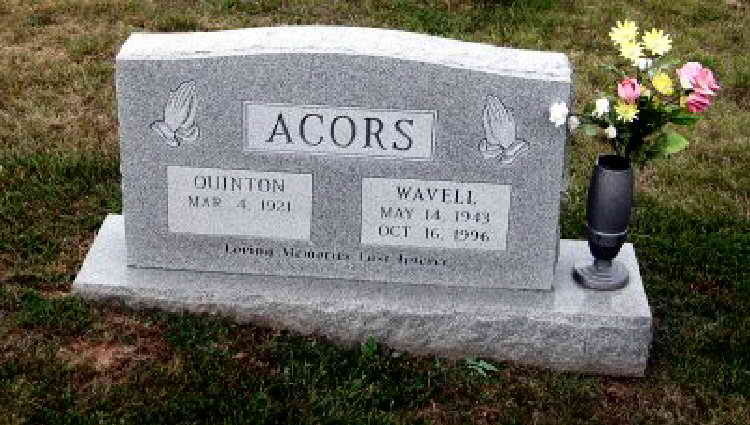 Grave markers for Quinton H. Acors in the Wilderness Baptist Church Cemetery, Wilderness Corner (Spotsylvania County), Virginia. While the family stone has not yet been updated to reflect Quinton's death, his military footstone does indicated that he made his Final Jump on May 1, 2003. Quinton joined the Army on July 29, 1940 in Richmond, VA. It is not yet know when he went through parachutist training but he was in the Hq Hq Company when photos were taken at Camp Mackall, NC in the Spring of 1943. Quinton was awarded the Bronze Star for his contributions during the Normandy Campaign.